One of the major problems in assessing the nature of the legal proceedings at Amboyna is the considerable gap that often exists between legal code or theory and legal practice. For centuries, English writers have condemned the case for violating the rules of Dutch justice but the reality is more complicated. Torture was legal in Dutch colonial possessions, in the Dutch Republic and across much of Europe in this period. However, before it could be used it generally required additional pieces of evidence, what is sometimes known as half proof. As the term suggests, half proof was a level of evidence that existed between a general suspicion and full verifiable proof, which generally meant the testimony of two eye witnesses. In the words of the 1570 Criminal Ordinance, torture should be used only “when the thing is so clear, and the proof so apparent, that nothing seems to be wanting but the confession of the prisoner to convict him without doubt”. However, there was a significant gap between this and the reality of legal trials in this period. In the Dutch Republic, the standard judicial instrument, the extraordinary trial, relied heavily on the use of torture even in cases in which clear evidence was not present. Writing in the eighteenth century, Bavius Voorda (1729-99) characterized the judicial procedure of the time as something more like a "monster than a properly administered judicial procedure.” Because of this, we should be careful of condemning the Dutch use of torture as illegal without considering the proper context. This is the relevant clause taken from the Criminal Ordinance of 1570. It clearly lays out a set of safeguards around the use of torture. In particular, it states that torture, should not be used without the presence of significant circumstantial evidence. While this may seem straightforward, the legal system in the Dutch Republic in this period was complex with no single authoritative legal code in place. The Constitutio Criminalis Carolina and De Criminele Ordonnantien van 1570, which is cited here, were not officially in force but they had a significant influence on the administration of justice. 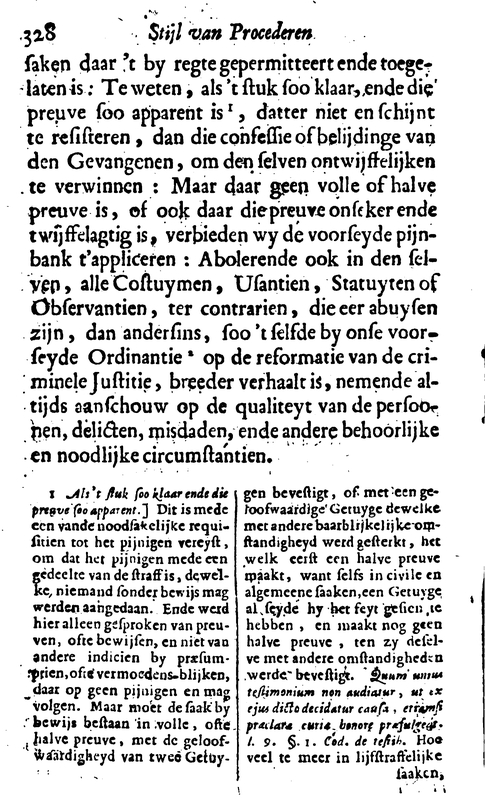 The English seized upon this notion of half proof and argued that its absence invalidated the Amboyna trial but they neglected to consider how most court cases were run in the Dutch Republic in this period. When and in what instance can torture be used? Strictly forbid all judges and magistrates whoever they are to use torture except in cases where they are permitted by law, namely when the thing is so clear, and the proof so apparent, that nothing seems to be lacking except the confession of the prisoner to convict him without doubt. But where there is no full or half proof, or where the proof is uncertain and doubtful, the application of torture is forbidden.